This article is AMAZING. And I can say that because I didn’t write it. It’s everything you need to know if you think your child might have an issue with something in their (or your) diet. How to figure it out, what the likely culprit is, and how to manage it. It’s fantastic and resource-rich. If it’s too long to read on a screen, skip to the end and download the full PDF for saving, sharing, or printing. Hello sleepy peeps! My name is Lori DeMauro I am a Mom to a beautiful one-year-old daughter named Annalise who has quite a few feeding issues, to put it mildly, with one of them being food allergies. It’s one of the things I was really unprepared for as a new mom and I fumbled my way through, making mistakes along the way, and driving myself crazy staying up late (in the few minutes the baby actually was sleeping) trying to find answers online. But if there’s a positive to all of this, it’s that I’ve learned a lot about food allergies. And hopefully if I share what I’ve discovered it will save some of you the same frustration. My daughter has an allergy or intolerance to each of the following: dairy, wheat, soy, eggs, and peanuts. She also may have celiac disease. The first symptoms of food allergies appeared when she was two weeks old, which is a really common time for symptoms to develop. At the time she was exclusively breastfed. She has had different reactions to different foods ranging from itchy red eyes to skin rashes to GI upset. This has made it very hard to determine what she was actually allergic to. I would research and take notes and think I had it all figured out and then eat something I thought was safe only to have her react. There are hidden ingredients everywhere. I have always been a health nut and habitual reader of food labels and I am a clinical researcher in my professional life so I thought I could take the knowledge I already had along with some quick research and be on my way. It wasn’t nearly that easy. With babies, you can never tell if a symptom is related to a food allergy or is just “normal baby stuff.” My daughter was born with several other health problems that compounded the issue with other symptoms. I could never tell which issue was causing which symptom or if they were all playing a role. In addition, being in the world we live in, there is actually too much information at our fingertips and I often found conflicting reports making. But there are some things we DO know. 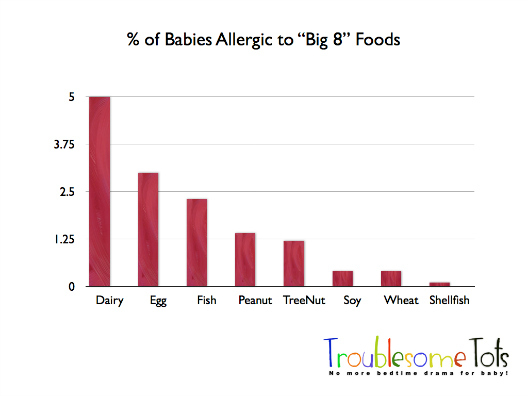 Food allergies occur in 5.1% of infants/children, up from 3.4% prior to 2011. 90% of all food allergies are related to what are known as the “Big-8”.That leaves 10% of food allergies related to “other things”, many parents report allergies to everything from corn to coconut. While this list can seem a bit overwhelming (there is one or more of these ingredients in practically everything you enjoy eating) dairy (also known as Cow’s Milk Protein or CMP) is the most common with various studies suggesting that anywhere from 5-10% of infants having an allergic response. How do you know if your baby has food allergies/intolerances? Determining if your child has a food allergy or intolerance is extremely difficult. Statistically we know that ~95% of babies have no issue with food so the default assumption should be that your baby does not have an issue. Also numerous studies show that parents self-diagnose their children as having food issues 4X as often as they actually do. So chances are that diaper rash is just a diaper rash, and not an indication of something amiss with diet. But some babies do have food issues and conclusively determining if they have an allergy and what they’re reacting to is challenging. So how do you figure it out? The best way to tell if your child is reacting to a food is to watch for symptoms. Also your child can have an allergy or intolerance. A true allergy means that the body has an immune symptom reaction, it responds to the food as harmful and creates antibodies to fight it. Symptoms can range from mild itchy skin to anaphylaxis. A food intolerance often has the same symptoms as an allergy, but is when a certain food irritates the digestive system or can’t be easily digested, so the symptoms are typically digestive (bloating, cramps, diarrhea). But wait, aren’t most of these symptoms common to all babies? A hoarse voice and vomiting/spit up can be due to reflux, and most babies have eczema, lots of babies have constipation. So how do you know it’s a food allergy? KEEP a FOOD/SYMPTOMS DIARY for you and/or your child (possibly both if you are nursing and your child is eating solid food). Be as detailed as possible, both in terms of what you/baby ate as well as any potential reaction. Make note of the time of day your baby ingested anything, whether its formula, breast milk, or solids. Then record physical symptoms and behaviors. Keep a diary for a couple of weeks and then look for trends. 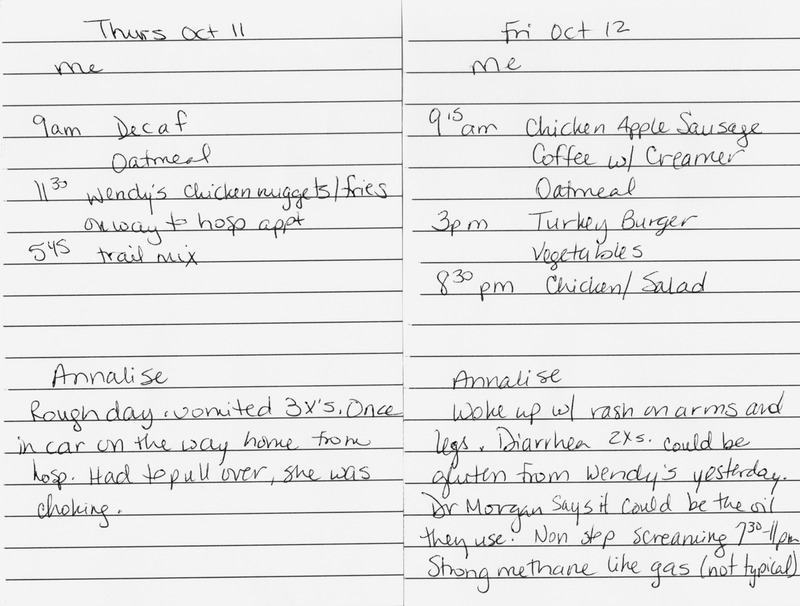 Without the diary, you are also likely to forget what you or they ate, or what happened. In addition, it is something you can show your pediatrician if you suspect an issue. Be sure to read labels of foods you eat if nursing or on formula/solid food packages. There is hidden dairy, gluten, corn, and soy in practically everything! Symptoms can range from subtle to severe. Without the diary, you might overlook them or attribute them to general baby fussiness, that cold they got at daycare, teething, etc. The timing of reactions can be an indication of the type of response as well. Intolerances are going to reveal themselves over longer periods of time (via the gut) where a true allergy can cause a reaction within minutes to hours of ingesting a food (typically via skin, GI, and/or respiratory systems). Take vomit for example. If your child vomits and has swelling of the face quickly after eating a food, that indicates an IgE mediated allergy. If your child vomits severely and has diarrhea but not until several hours after ingesting a food, that indicates FPIES. FPIES vomiting can be so severe that it leads to dehydration or even shock. However if your child vomits a small amount hours to a day after ingesting a food and also has eczema or other GI symptoms, this indicates an intolerance. If, after consulting with your pediatrician and possibly a pediatric allergy specialist, you feel confident that your child has a potential food allergy or intolerance, you’ll need to start cutting those foods out of your child’s and if you’re nursing, your diet. Seems simple enough but in fact can be an enormous challenge. Allergens are hidden in just about everything you eat, infant formula, ready-made baby food, etc. If you’re looking for practical advice on how to safely navigate food allergens (for both breastfed and formula fed babies) keep reading on the next page (click link below). This is a remarkable post. Thank you so much for getting it all out there. It must be very difficult, but what you’ve done here will make it easier for other parents in the same or similar situation. She’s a really remarkable parent and researcher. I felt challenged by our relatively garden variety reflux issues. But when your child is allergic to everything and you’re reduced to eating “rabbit food”, and introducing solid foods is a bit of a dietary crapshoot, it’s a whole different level! But I’m not sure about blood test. The upside is that it’s not a huge deal to do it. But my understanding (note: not an expert by any means) is that they’re prone to false positives/negatives which can lead people astray? Thanks for posting this! I have Celiac disease and have kept my 18 month old gluten free so far, mainly because I have no idea when is appropriate to introduce something that could make her sick. :/ I’d love to bring it up to her pediatrician, but my experience with doctors and Celiac disease has so far been that I really have to do my own research. I will check out these links, but is there anywhere else I can go to get information on when and how to introduce gluten to her? Not to stress you out but it seems to suggest that sooner is better? PS. Also check out Lori’s response below (you may not have been notified via email but she’s addressing your concerns :). In one of those articles, the researcher talks about slowly introducing gluten. His research mentions a prime window at around 6 months old. and that breastfeeding while doing this is most protective (with the mother still gluten free). However, if you are past this point, I think any slow introduction would be acceptable. We are actually doing this now (while still nursing). A few months have passed since I wrote the initial draft of this article and a few things have changed for us. my daughter will be 14 months on Friday and we have been allowing her to have a small piece of regular bread or a tiny bit of pasta 1-2 a day. it is going so much better than when she was younger. Her ezcema is still flaring some but no major GI upset, so yay! For us, GI said to start with just a few wheat puffs or pieces of pasta at a time and very slowly work up. (We tested negative to wheat allergy last month so we determined it was an intolerance and hence started the gluten trial). I still worry about celiacs based on some of her earlier symptoms but we are taking it slow and only time will tell. We tried the same trial with dairy recently and it didn’t go as well as the wheat so we backed off again. GI said it would take longer to grow out of dairy intolerance vs gluten. Good luck with your gluten trial! Of course if they keep putting out books that talk about how gluten is making us fat, stupid, and giving us cancer I may have to give gluten up too. But damn you crusty french bread, why do you have to be so tasty? Thanks for posting this article! One thing that the author undoubtedly knows is that once you confirm an allergen (either RAST/skin/diet tests), avoidance is one of the keys if there is any chance to outgrow the allergy. The more times the child is sensitized to the allergen, the more likely it is to stress the body to the point of being permanent. It isn’t easy, but it’s worth it. Our 21 month old was allergic to all of the top 8, plus some, but with meticulous (obsessive) avoidance in my diet, we have slowly been able to reintroduce foods, with only dairy, egg, chicken, shellfish, peanuts, nuts and soy remaining. It seems like a big list, but it’s a huge improvement. Unfortunately for me, our 3 month old is allergic to everything on his brother’s list, so back to avoidance for me. It’s just MUCH easier in the US than it was in India! Good luck to all you mama’s out there living with this! I think I remember you. Are you living on steamed carrots and rice?!? That is a rough list of foods. But I’m really glad to hear that you’re having success slowly reintroducing things. I can’t imagine how hard it is to take a toddler to ta playdate without having to worry about that every food item the other kids are eating is going to cause problems for yours. I mean it’s easy(ish) when there babies and relatively immobile. But then they turn into toddlers and preschoolers and now you have to convince your 2 YO not to eat the cheese goldfish that her buddy hands her at the park. Wow. Good luck to you! Thank you so much for this post! My 5-month old has FPIES to dairy and soy. I couldn’t believe Lori even mentioned it because most pediatricians haven’t encountered it, let alone laypeople. While so many parents will joyously give their little ones solids for the first time, we will only introduce a new food on a weekend after she has napped and mommy and daddy have showered in case we have to make an immediate dash to the ER. (We learned this the hard way.) Thanks for sharing this, Alexis! But OUCH – I can’t imagine how stressful this must be for you. Good luck with everything – we all hope you have no more ER trips in your future! Thank you for this! I’m on day 8 of a dairy/soy free diet because my 12 week old has been pooping the slimiest, stinky-est poo for a month now. He’s moderately gassy & spits up quite a bit, but overall happy & healthy. Doc isn’t concerned, but I feel like something is wrong. Either that or I being an overly cautious 1st time mom 🙂 anyways, it’s nice to have these kinds of resources. Have you seen any difference in with the stinky poo? I’m guessing it’s unrelated and you could go back on diary/soy (do you really want to be chocolate-free at Halloween!?!?). I only say that because usually kids with a food allergy will have a stronger response than stinky poo. If he’s happy, eczema-free, etc. maybe you can gleefully go back to enjoying a nice dairy latte? Anyway glad this article has been helpful to you! Thank you for your reply! Well…the only difference has been that instead of 3 huge poops a day, he’s down to one gigantic one every 2 days. It’s still slimy though, basically the consistency of thick gravy. I would LOVE chocolate and a grilled cheese sandwich. I just kept hearing/reading that the poo should not look like that. My daughter, 5.5 months now, was a mess wen she was born! About 2 weeks after her birth, she stopped eating, started vomiting, and had severe acid reflux. Turned out she had a milk intolerance as well as laryngomalasia, floppy larynx, and a urinary tract infection due to a condition that made urine reflux into her kidneys! This is totally not food related but just added fuel to the puking fire! Utis are notorious for causing feeding issues and vomiting! She was a crabby, colicky, sick baby and I was besides myself! We went through five different formulas and would up on alimentum which I practically had to rob a bank to pay for as one ready to feed bottle lasts one day and is $10- a bottle! Fast forward to almost 5 months of her sleeping on my chest on her belly since she was 3 weeks old due to choking and acid reflux,and she was running our house! Needless to say my older son was not happy! We had to walk for hours at night to get her to sleep! She was up five times a night and everyone was miserable! I couldn’t sleep or move because the slightest move would make her gag and choke and usually vomit! Plus I was petrified I would roll over on her! I spent her first five months in a perpetual half sleep while my hubbie slept on the couch! Finally one day she was up from 7am – 7pm and I was done! We never thought she would ever be ok on her own but after there nights of placing her down mostly awake, she cried for 15 min and passed out! She has done this ever since in her own crib in her own room. We know we owe it all to the formula switch and of course she outgrew the acid reflux and floppy larynx. My point is, if I hadn’t followed my gut and switched her formula on my own hunch since the pedi kept saying she was fine, I fear we never would be where we are now! All of us are happy, rested and my son does not feel neglected anymore! Now she is back on regular formula, as she also outgrew the milk intolerance and the floppy larynx and eats everything! Solids have really helped absorb everything and made her so much better! Anyway, just wanted to share as food issues can be a MAJOR reason your child is not sleeping! Yep – food issues are rare but when you have them BOOM things are so hard (sleep, soothing, etc.). Good for you for listening to your instincts and getting things sorted out. And thanks for sharing your story! Hi my 5 month old has silent reflux and suspected cmpi he is on nutramigen aa a formula which contains no dairy soy or lactose, carobel which is a thickener and is on losec for his reflux yet he still has crying wind spasms at night wakes crying during the day gulping after 30 min naps wakes constantly during the night has issues with constipation diarrhoea conjestion and eczema despite all the interventions. Wow that is rough. For starters it might be worth experimenting with a different PPI – sometimes a different medication can help different kids. Possibly consider prevacid? Or at least chat with the pediatrician? It sounds like food allergies but you’re doing all you can. What other likely allergens remain in his diet? I’m thinking corn would be the only thing left but honestly I’m no expert. And lastly given what you describe I would STRONGLY encourage you to consider having him sleep in a swing. Won’t hurt, very likely may help? My daughter uses Nutramigen as well, and Zantac. Plus gas drops at every feeding. She has slept in her swing since two months old. It helps tremendously. Even with a wedge under her crib mattress she would wake screaming with milk coming out of her nose. I think your baby may be hungry. My baby is much smaller than yours, and she is eating more Than 24 ounces. She will be 4 months next week. She is very petite. Your pediatrician obviously knows better than I do, but please ask. Small feeds more often are helpful with reflux. Good luck. I’m disappointed to hear you suggest food allergies are rare. They are actually quite common these days. Gluten and dairy being the biggest offenders. Gluten intolerance is the cause of many autoimmune disorders! My hashimotos husband and rheumatoid arthritis cousin have CURED themselves of their disorders on a gluten free diet. What a great post. I wish I had read this 6 months ago! We had an awful time with my son and a milk allergy. I’ve had to cut out everything that has milk protein from my diet. Most people assumed that his fussiness was normal, but once we cut out the milk proteins we had a completely different baby on our hands! It’s been tough, but worth it! Lisa maletzky, I feel your pain. We had colic, food intolerances, reflux, motility disorder and hyperalgesia all at the same time. Reading your post reminded me of our first few months! Thanks Lori! Helps so much to know we were not te only ones! Things are so much better now I shudder when I think about when she was first born! This is a wonderful post and helps us to understand the difference between allergies and intolerance. It can be so confusing. Thank you for sharing this with us! I had to eliminate fish food for my son, he had a terrible allergy after using fish. Now everything seems to be much better. Have you ever heard of babies developing a food sensitivity at 12 weeks? My daughter is breastfed and has been screaming through her feeds for the last two weeks. Very gassy too. Her Dr suggested I cut out dairy. I’ve had the same diet since she was born and I can’t think of what else it could be. Absolutely. It’s also entirely possible that the sensitivity has been there all along but it builds up over time with exposure. 10% of babies have issues with milk protein (which hides in EVERYTHING – you’ll need to read labels) so it’s definitely worth cutting out for a few weeks to see how things go. Good luck! Is that statistic about goat’s milk really true? I must say I find it hard to believe that 65% of the world’s population drinks goat’s milk. India is one of the most populous countries, and i know they do have a lot of goats there, but also plenty of cows. But some other crowded countries I’m not sure about. Do they even consume much dairy products in China, for example? I have to say I don’t really know. Thanks for the article. Still looking for answers though. My grandson is very allergic/intolerant to many foods. It started very young where he was only the second child that our specialist treated in 25 yrs with a homemade formula. I help my daughter make a formula daily for him. Made from complete amino acids, oils, sugar, salts etc. Since then she has started foods for the last few months, he will be 1 yr in less than a month. He can only eat sweet potatoes and butternut squash. Allergic/intolerant to carrots, string beans, peas, apples, peaches, and now turkey. Trying to figure out what sweet potatoes and butternut squash have in common that will allow his body to accept them. I’m thinking intolerance from articles I’ve read because causes belly pain. Wakes up screaming, fidgety while sleeping and fussy all day. Keep him on for about 2 days until he seems miserable then take food out of diet and 48hrs later a completely different child, completely happy. Hoping for any info that can help us and dr solve this problem. Find it hard to believe he’s allergic to basically everything. Don’t know if over looking digestive problem or not. Anyone that reads this, please feel free to make suggestions if you have read about something like this. Thank you and good luck to all of you dealing w your own baby issues. Look into leaky gut syndrome. If anyone is in antibiotics, it can disrupt the natural flora of the gut. The gut would need to be healed first, then you might be able to reintroduce foods. Also, I have read about eating small amounts of foods that are problematic every four days. I would stay away from the major offenders for a while. (eggs, gluten, dairy, soy, nuts, corn, and shellfish. Need to find some good proboitics to help heal the gut. I have a leaky gut with gluten and dairy sensitivities. Unfortunately, I have passed food sensitivities down to my own children. Have read that bone broth is great at healing the gut and giving your body important minerals and vitamins. Must be from an organic source though so you don’t consume unwanted pesticides. Good luck! Our daughter is almost five months, and has both milk and soy allergies. Most people look at me like I am crazy when i tell them of her allergy! If anyone has any advice I would greatly appreciate it! she drink Elecare- still has mucousy stools, with occasional blood. I am tired of going to clinics and specialists on a regular basis…..
Gluten and dairy are what I hang my hat I n plus it helps to go non gmo and don’t eat fish unless it’s wild caught. The living conditions and antibiotic use of farmed fish is disgusting! Wheat has changed since the 50’s. Dairy is best consumed raw as its easiest to digest that way, if you can’t consume raw you shouldn’t consume it. Dairy also causes a calcium imbalance causing magnesium supplementation to be necessary. Calcium is very overrated. Magnesium is under appreciated. Great tips! as early as it is, we should build up a good immune system for our baby. I’m a little histerical whenever our a little Timmy get rashes or diarrhea especially I’m a working mom I can’t be there 24/7. I often leave my baby at my sister’s home and call her for a time to time update. Little buddy is so sensitive with seafoods and nuts. Thanks for sharing this post Alexis. I was super excited to find this article! My 3.5 month daughter was diagnosed last month with fpies by GI. We were lucky that although she does vomit and has reflux, her symptoms came more in the form of painful crying and mucous blood streaked stools and her growth is good. She is currently ebf but I am also dairy, soy, peanut, gluten and egg free. I didn’t notice much difference with eliminating the first three, but her crying/colic stopped within 24 hrs of eliminating wheat and her exzema cleared within two weeks. Cutting out eggs finally stopped the bloody stools for good. don’t worry about solids, i’ve been at it for 9 months now – though we left most things till about 7 months as my son wasn’t interested and we were worried too. My son is allergic to dairy, eggs, nuts & peanuts and then a whole load more in the “other things” list, but we just tried one thing at a time and keep a food diary – and to be sure i eat something myself first to see if he reacts through the breastmilk, and then if that’s ok try him on a small bit himself. He’s been pretty much eczema free and bloody stool free for 8 months, except a day here or there when we first tried foods he didn’t agree with. we’ve still got a long list waiting to be introduced (teething, colds etc keep getting in the way) but it’s getting better, we can eat corn again now, and custard (which i love) and i’ve found some great gluten-free vegan recipes for puddings, so it’s do-able, it’s just hard work!